Big Jon sports has done it again and is bringing another great product to the trolling market. Well, BigJon has done it again and have partnered with another US company to come out with their own line of trolling spoons. These spoons are designed by fishermen for fishermen. They are available in two seperate sizes and in an incredible variety of colors. 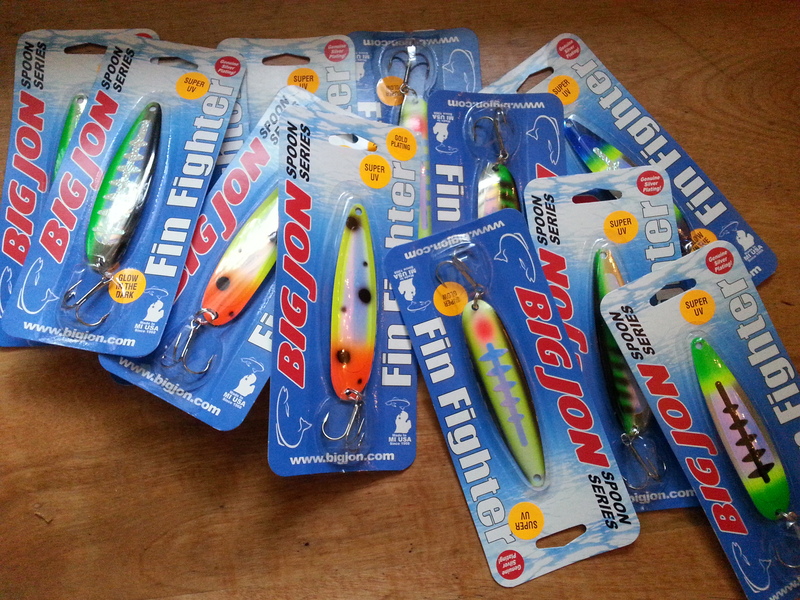 They are the “Fin Fighter” in 4 1/2″ and the “Lil’ thumper” in 3 1/2″. The colors of these spoons are intense and they are in the Ultraviolet and glow patterns. If I had to pick colors for spoons to use these would be it. It is almost as though BigJon was inside my head when these colors were developed. Colors such as “Migas Touch”, “Nightmare”, “Cosmo”, and the list goes on and on. The availability of these is limited currently, but once production ramps up you are sure to see these all over at the retailers. It doesn’t matter if you are after salmon, trout, or walleye, these spoons are just the ticket to catch fish. Watch for upcoming photos of fish with the BigJon spoons hanging from their mouths!